Boasts 47 Highway MPG and 44 City MPG! This Toyota Camry boasts a Gas/Electric I-4 2.5 L/152 engine powering this Variable transmission. Window Grid Antenna, Wi-Fi Connect Mobile Hotspot Internet Access, Wheels: 8.0J x 18 Chrome Machined-Finish Alloy. *This Toyota Camry Comes Equipped with These Options *Variable Intermittent Wipers, Valet Function, Trunk Rear Cargo Access, Trip Computer, Transmission: Electronic Continuously Variable -inc: sport mode, Transmission w/Sequential Shift Control, Toyota Safety Sense P and Rear Cross-Traffic Alert (rcta), Tires: P235/45R18 AS, Tire Specific Low Tire Pressure Warning, Strut Front Suspension w/Coil Springs. 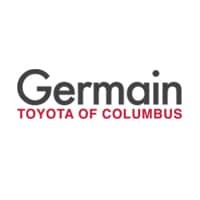 * Stop By Today *Stop by Germain Toyota located at 5711 Scarborough Blvd, Columbus, OH 43232 for a quick visit and a great vehicle! HYBRID, TOYOTA SAFETY SENSE (PRE COLLISION SYSTEM, AUTO HIGH BEAMS, DYNAMIC RADAR CRUISE CONTROL, LANE DEPARTURE ALERT W STEERING ASSIST), NAVIGATION PKG( ENTUNE 3.0, APP SUITE, DYNAMIC NAVIGATION GPS, JBL W CLAR FI, 9 SPEAKERS W SUBWOOFER AND AMP, 8 TOUCHSCREEN, SIRIUSXM, CONNECTED TOYOTA SAFETY SERVICES, WIFI BY VERIZON), ADAPTIVE HEADLIGHTS, DRIVER ASSIST PKG (BIRDS EYE BACK UP CAMERA, CLEARANCE SONAR, REAR CROSS TRAFFIC ALERT),SUN ROOF, HEATED SEATS, LEATHER, PWR FRONT SEATS, SMART KEY PUSH BUTTON START, QI WIRELESS CHARGING, APPLE CAR PLAY, 18 SILVER ALLOY WHEELS, REAR BUMPER APPLIQUE, MUDGUARDS, PAINT FILM PROTECTION,The 2019 Toyota Camry is a substantial four door sedan with sleek exterior styling and modern features for comfort and convenience and hybrid fuel efficiency without sacrificing style and power. The leather interior features heated and power adjustable front seats, sun roof, and 60/40 split/fold function for pass through trunk access. The Entune 3.0 audio system with Apple CarPlay includes JBL Clari-Fi, Am/FM/CD radio includes an 8 touchscreen display with Bluetooth for connecting to your compatible device, SiriusXM for unlimited entertainment, Navigation so you never lose your way, connected services, WiFi by Verizon, and a back-up camera that significantly reduces your risk of rear collisions. Toyota Safety Sense provides peace of mind with the Pre-collision system that provides emergency braking, auto high beams detect oncoming traffic and switch from high to low beam, dynamic radar cruise control adapts to the flow of traffic, and lane departure alert warns when drifting out of your lane and assists in maintaining lanes. Additional features include the blind spot monitor with rear cross traffic alert, smart key access and push button start and QI wireless charging.This vehicle is available for a test drive most days of the week, but we suggest reaching out to us beforehand to make sure it is out front and ready for you when you arrive. With several financing options and lenders available, we pride ourselves on providing quality vehicles that fit into your budget. For our most up-to-date pricing and newly added inventory, please visit us at www.GermainToyota.net. We have sold to customers all over United States, and offer a seamless, professional process. Easily accessible just minutes from downtown on Scarborough Blvd, we also offer free airport pickup. Germain Toyota: The Right Car. The Right Price. The Right Way. **Deferred 1st payment for 90 days with approved credit through primary lender. 650+ Trans Union credit score required. Interest accrued during deferral. Cannot be combined with any other offer. Not valid with special APR financing or lease incentives. Valid now through 4/30/19. See dealer for details.